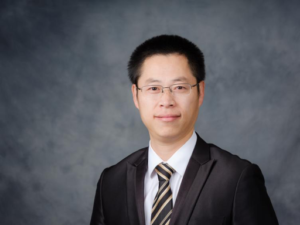 The Graduate School of Arts & Sciences at Wake Forest University has named Dr. Chaowei Zhu Assistant Dean for Global Initiatives, effective January 1, 2019. Dr. Zhu, who currently serves as the Co-Director of the Chinese and Arabic tracks and of the ISH track in the Interpreting and Translation Studies Program (ITS) at the Graduate School, has over fifteen years of experience in teaching and leadership positions in higher education in both China and the U.S.
Dr. Zhu joined the Graduate School in 2015. In his new role, Dr. Zhu will be responsible for planning and managing the Graduate School’s initiatives on international promotion and development, as well as building and maintaining relationships with global institutions. Dr. Zhu earned his MBA and PhD from Renmin Business School at Renmin University of China in Beijing, and his MA in Intercultural Services in Healthcare from Wake Forest University.